Horizontal dial 50 ft in diameter. Bronze octagonal sundial with flaring flange decorated with the 12 signs of the zodiac. Dial rests on an octagonal stone pillar. 37' Iron Composed of four iron rings bisected by an arrow. Mounted atop an upright cylinder. Gift of Lucile Teeter Kissach. Restored 1993. A ground level horizontal dial 14 feet in diameter, with gnomon 5 ft 3 inches high. The dial is made of concrete, brick, and granite. "Hora Novem" An unusual 'solar calendar water sculpture' incorporating water jets which converge at center of a 17ft equatorial ring. A 24 inch diameter stainless steel armillary dial with equator, meridian and horizon rings. The armillary includes compass points and zodiacal symbols. The dial sits atop a 6 foot tall architectural sculpture of four two-columned arches also made of formed and welded stainless steel sheet with a random polished pattern creating dark and bright areas that change as the sun moves across the work. The armillary is held by fingers of a sculpted hand, representative of works by the designer, Alvin Sher, and symbolizing mankind, creativity, knowledge, peace and greeting as well as identity among many other human meanings. 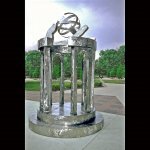 The dial sits atop a six foot tall stainless steel architectural sculpture with four pairs of columns with a supporting arch between each pair. The entire sculpture is made of textured and welded sheet up to 3/16 inch thick. A horizontal dial on a stone block. Dedicated to Leslie C. Peltier, recognized as "World's greatest non-professional astronomer" by Harvard Observatory. Dial sits atop a stone block, possibly marble. This horizontal sundial is built on a one-meter cube of red granite with a cast bronze gnomon supported by a cast bronze Pegasus modeled by New York artist Carl Paul Jennewein. The dial's plaza location overlooks the village of Granville and the valley beyond to the south. The dial is a tribute to Clifford S. Stilwell (Denison Class of 1912) who was Chairman of the Denison Board of Trustees at his death in 1941. The early B&W photograph of the Pegasus gnomon is courtesy of Denison University Archives. When is a flag pole more than a flag pole? When it has cement walkway curved for the summer solstice, a path for the winter solstice and a distinguishing straight cement line for the spring and fall equinox. 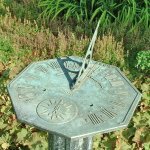 This dial has no hour markers, and is intended to show the seasons. The tip of the flag pole will follow these lines at the appropriate day of the season. A three foot armillary sundial with equatorial ring and gnomon pointer on a stone base with dedication plaque. Dial was built by the local high school vocational welding class in 1988. Brass or bronze Gift to the College from the Class of 1907. On S side of gnomon, an embossed figure, possibly Father Time with scythe. Mounted atop a carved stope base with motto, "United in time, parted in time to be reunited when time shall be no more."